Please watch the short video below to see how this site can help you find your next home! Welcome to EugeneRealtyGroup.com and thank you for visiting! You can easily search for all homes for sale in Lane County. Our team of experienced, and friendly agents are here to help with all of your real estate needs. Please don’t hesitate to contact us for any assistance. We’ll be sure to get in touch with you right away! Search all listed homes, condos, and land for sale in the Eugene/Springfield area. You can also save your searches and favorite properties to review at a later time. Also, don't forget to sign up to receive alerts the minute new properties come on the market, or have a price reduction. What’s My Home Worth in Lane County, OR? Receive a free report that will give you a broad range analysis regarding how much your home is currently worth. This free report will be emailed to you instantly! Looking for a distressed property or bargain? 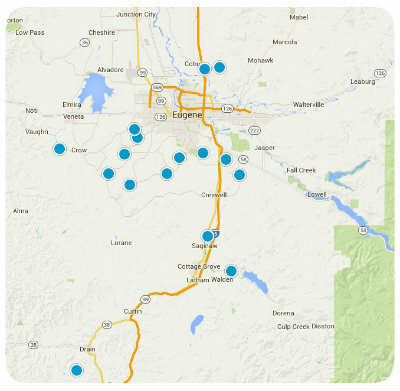 Check out all of the available foreclosures in Lane County! You can even save your recent searches and receive alerts when new foreclosures hit the market. If you're wanting to explore all of the brand new homes for sale in Lane County you've come to the right place! We have plenty of them for you to check out. Lane County has a number of luxury homes for you to choose from. To see what's available all you have to do is follow the link above. Popular areas and cities in Lane County include: Santa Clara, Danebo, River Road Area, North Gilham, Ferry Street Bridge, Hayden Bridge, Creswell, Cottage Grove, Veneta, Thurston, Springfield, West Eugene, East Eugene, Southwest Eugene, Coburg, Junction City, and Florence. "Highly recommend. Best experience we have had searching for a house to buy." - Amber and Calen S.
"I’ve never worked with a better agent. Thank You So Much for being so thoughtful, reliable, consistent, and downright wonderful! "- Karen R.
"We would recommend them 100%!" - Dave and Rhonda M.
To read more of our reviews click HERE.